This week's Bread Baker's Apprentice Challenge is Peter Reinhart's recipe for Pain Siciliano (which you can get from his book below, starting on page 198-201). Friends joined me in the kitchen and together we prepared this simple and versatile bread recipe. This Pane Siciliano is one of the breads that taught Peter Reinhart the value of combining large portions of pre-ferment with overnight cold fermentation. The recipe calls for semolina flour, but I was unable to find it in time for my bread baking day. Semolina flour is made out of durham wheat and has a gritty, sandy texture. Durham wheat is commonly associated with pasta that's also a high protein wheat but low in gluten. Ideally the bread should have a blistered crust with large irregular holes, similar to French or Italian bread. But since I'm still so new to bread baking and didn't use semolina (I used all bread flour), this didn't come out quite as it should. However it was still delicious and a beautiful shape. I hope to revisit this again and try it with semolina flour for a closer end result! To bake this bread, three days are allotted. Day 1 is to make the pate fermentee, the starter for the bread. Day 2 is to de-chill the pate fermentee, mix, ferment, shape and pan the dough. Day 3 is to proof and bake. It's definitely a bread that needs enough time for the dough to develop to get the perfect end result. 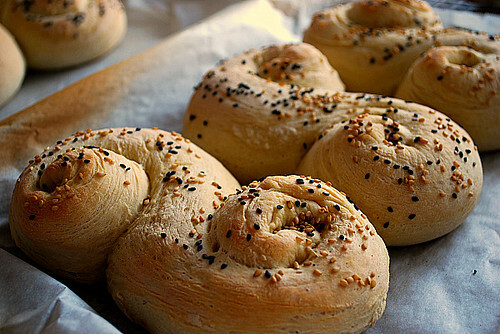 This bread is amazingly beautiful Joelen! Great Job! What a gorgeous loaf. Your S shape is perfect. Glad you liked it. 3 days is quite a time investment for a loaf of bread.